The straw which broke the camel’s back was a group of walkers who, despite an orange level weather alert for heavy rain and strong winds, still decided to tackle the Masca Barranco. 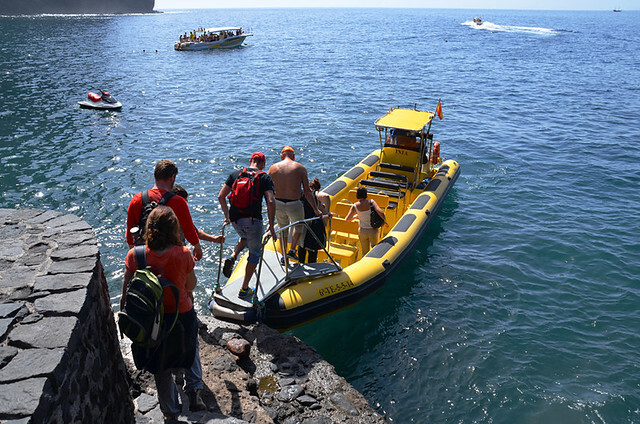 Reaching Masca Bay they found the jetty damaged and no boats waiting to take them back to the safety of civilisation. There was also a weather alert for wild seas which kept the water taxis in harbour. They were lucky a goatherd was seeing out the storm in the area as they would have attempted to walk back up the ravine, possibly resulting in a more tragic end to this tale. The goatherd advised them to stay put, leading the stranded hikers to a cave where he knew they’d be safe, sharing some of his food and water. The following day the emergency services were able to rescue the walkers from Masca Beach. Later that day the goatherd spotted more hikers in the ravine. 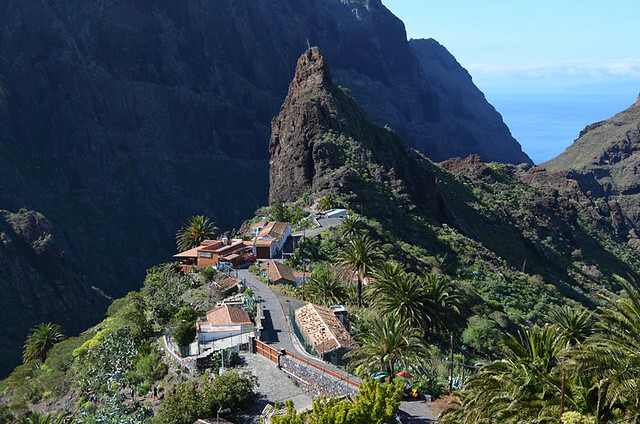 Within the following week the authorities announced the closure of Masca Barranco, prohibiting members of the public from entering it until measures were put in place to make it safer. It’s easy to blame this group of walkers for the closure of the ravine. There’s no arguing their actions were irresponsible and not something I’d expect from experienced hikers. 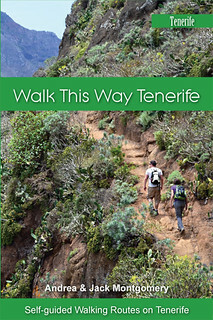 But we regularly maintain even experienced walkers can underestimate the terrain and weather conditions on Tenerife and other Canary Islands. But the fact is the walkers in question were only the latest in a long, long line of people who are ultimately responsible for the closure of the Masca Barranco. The Masca Barranco is unique on Tenerife. The fact that it is a barranco doesn’t make it unique, there are plenty of other narrow ravines around the island. But none attract anything like the volume of walkers which descend on Masca. Around 100,000 people tackle it each year. It’s big numbers, and big business. Unlike most other walking routes on Tenerife, Masca attracts people who might not normally include hiking as one of their popular pastimes. 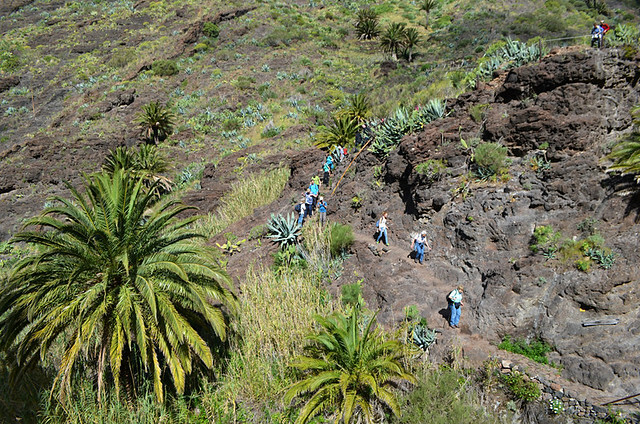 Whereas nearly every other walking route on Tenerife requires some effort/planning on the part of the individual, tour/walking companies make it easy for anyone to attempt to walk the ravine. Subsequently, Masca is a bit like the hiking equivalent of a coach excursion. Too many of those who walk it simply aren’t prepared for, or up to the challenge of, the route. Despite what some hiking companies might say, it is a challenge. Accidents are, therefore, inevitable. 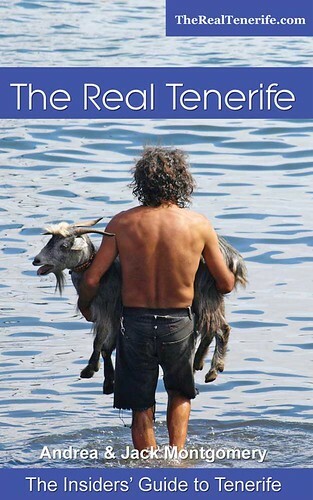 As the goatherd who helped the stranded walkers pointed out, walkers are rescued from Masca Barranco nearly every week. 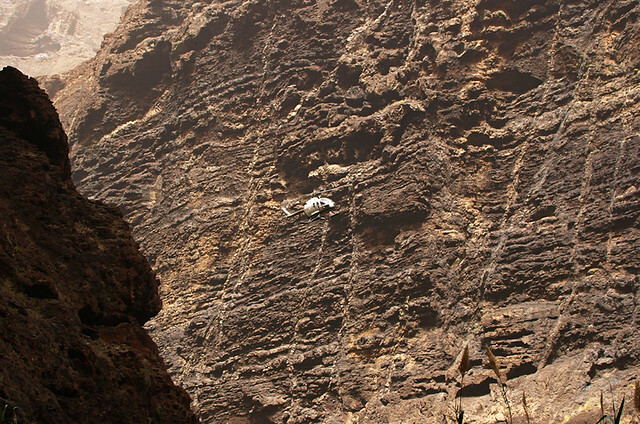 For some time the mayor of Buenavista del Norte, the municipality where Masca is located, has voiced concerns about the unusually high number of people who have had to be rescued from the ravine. It’s an unnecessary drain on resources, and rescues in inclement weather can also result in those in the emergency services having to risk personal safety. It was inevitable the ravine would be closed at some point, the walkers who spent the night in a cave were just the final straw. Is the Masca Barranco dangerous? Is Masca Barranco so dangerous it needs to be closed? 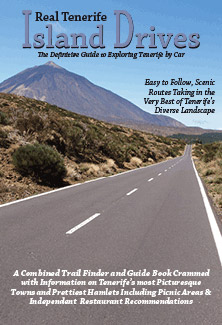 The simple answer is no more than any other route which involves narrow, paths, steep ledges, uneven terrain, and there are plenty of those in the Canary Islands. There’s no doubting that injuries to people not suited to walking it have made it appear to be more dangerous than it really is. However, as the party rescued from the beach illustrates, some experienced walkers haven’t exactly helped the situation. 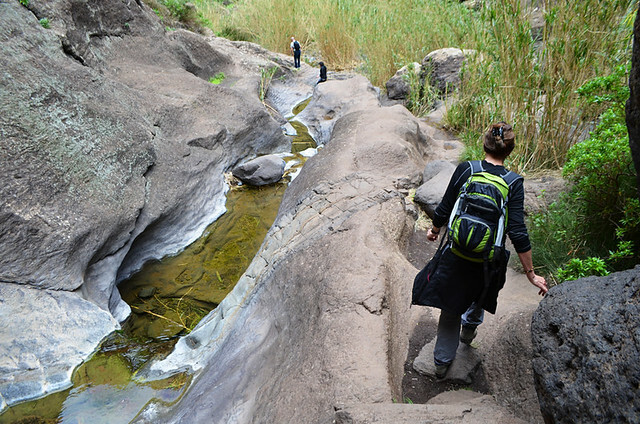 This is partly because the demands of sliding down rocks, easing around narrow ledges or negotiating stepping stones across pools require a certain amount of agility and suppleness that isn’t normally required on the average walking route. And partly it’s because of a lack of understanding of the terrain and how the weather affects it. 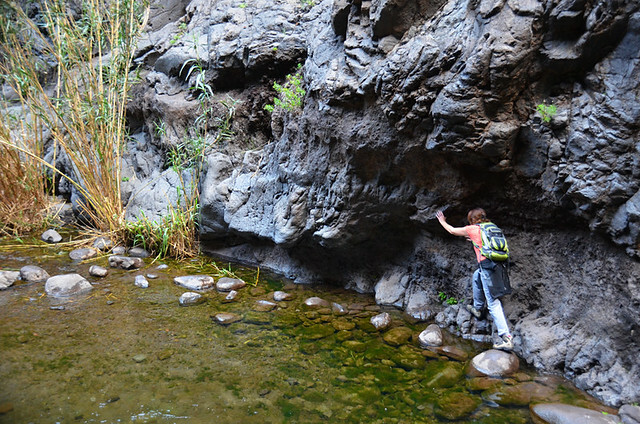 Walk Masca Barranco after a long dry spell and you might declare it as not being half as challenging as you expected. Walk it a couple of weeks after there’s been heavy rainfall and raised water levels mean tricky pool and stream crossings, and an awful lot of slippery stones to negotiate. We walked it under these conditions in Feb 2017 and it made the going far more difficult. As for walking it a couple of days after heavy rainfall… don’t. There’s an increased risk of rockfall. You really don’t want to be in any narrow ravine in the days following heavy rain. Any experienced walker who has walked extensively in a specific destination should know walking routes can change depending on the time of year. 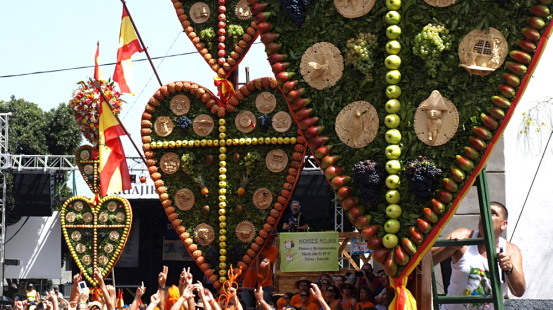 Those in the Canary Islands are no different. 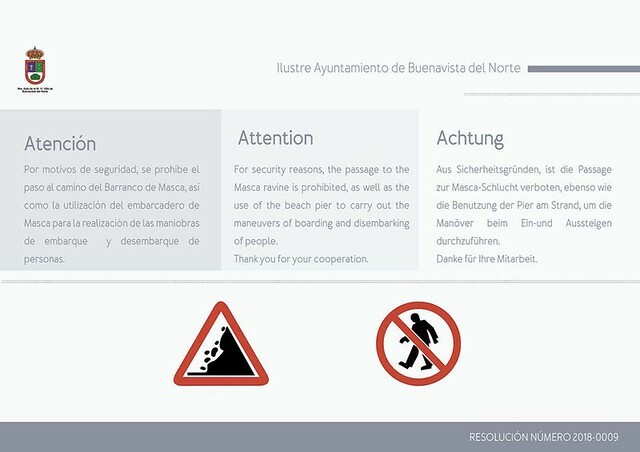 So the authorities are going to take steps to make the Masca Barranco a safer place to walk. There will be safety barriers at danger spots; masts will be installed so phones will be able to pick up a signal everywhere in the ravine; rangers will be posted at various points along the trail, and the jetty at Masca Beach will be improved. My concern is the route will be transformed from a wild adventure trail fashioned by nature into something which is more of a sanitised theme walk. I like nature to be, well, natural. For me, there’s no question it will lose some of the qualities which made it so enjoyable. But thanks to the irresponsibility of some (I’m not just referring to walkers here) these steps are essential. How long Masca Barranco will remain closed is like asking how long is a piece of string. My feeling is it won’t be excessively long. Walking the Masca Barranco is a huge tourist attraction. There will be a lot of pressure from the many businesses for whom a closed Masca Barranco means a loss of income to get it open again as soon as possible. Meanwhile, although finding Masca Barranco closed might be a disappointment, the majority of Tenerife’s other excellent walking routes aren’t… and on most you won’t have to share the trail with hordes of other walkers. Thanks for the great informative post, Jack! So the trail is still closed I imagine? It is. We’ll post something as soon as we get news it’s open again. I walked the Masca Barranco! It was downright frightening at times, but we did it! If you are careful, it can be a great adventure. Hope they don’t “dumb it down” and make an over-run tourist spot out of it. Still officially closed I’m afraid. We’ll post information on here and on our Real Tenerife facebook page as soon as we hear any updates. Hi there – when you say “officially closed” do you mean that yes, there are signs saying it is officially closed but people are hiking it anyway? There are official signs showing it’s closed, but some people ignore them. There’s been at least one incident since the route was closed where walkers had to be rescued from the ravine. There are still reviews of the walk being posted on Tripadvisor, in one case with children in tow, and a couple suggest water taxis will still pick people up from the beach, otherwise it’s a hard trek back up the barranco. Personally I think it’s crazy to attempt this one when it’s officially closed. There are more accidents here than on any other Tenerife walking route, and if anyone was to be unfortunate enough to get into trouble in the barranco when it was officially closed, it would turn out to be a very expensive walk… or worse. Any ideas of when it might re-open?? We are coming to the Canary Islands in November. The plan is to have all the safety measures in the ravine in place by the end of the year. However, the Mayoress of the municipality where it’s located has been talking about opening it in October as long as some of the safety measures have been completed. But a decision has still to be made. We’ll post an update as soon as there’s any firm information from the authorities. Thank you for the update. I’m flying in November 21st. I hope its open by then. There is and it’s not good. 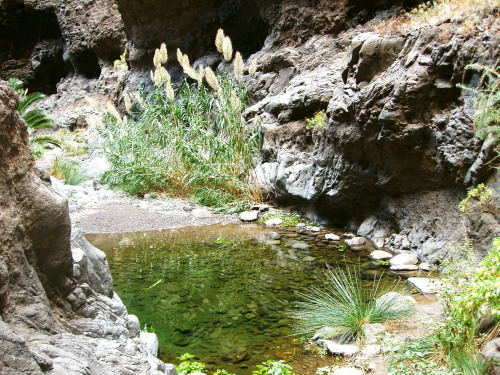 We posted information on our facebook page a few days ago that there had been an official announcement from the Tenerife Government to say it was unlikely the ravine would be open before March 2019. I’m staying in Los Gigantes this week. Having stayed here for five years for numerous holidays. Finally I decided to do Masca, to be told it’s closed until March at the earliest. I thought this update might serve others well. We’ve already posted this information on our facebook page and Twitter account, and also advise customers about it when we send our walking routes to them. Is the anticipated opening date still March 2019? Has a specific day been announced yet? There’s no change yet Emily. But this is Tenerife we’re talking about, you don’t get specific dates until the last minute, not ones that are adhered to anyway 🙂 We’ll be posting any updates on our facebook page as soon as we hear anything different, or if March is definitely confirmed. I was there today, march 8. IT is still closed and nobody could tell anything new about when it Will open again. In November last year the mayor of the municipality where Masca is located said it might be March or April before it is open again, but it would depend on how things progressed during winter when weather could slow work down. We’re checking official news for updates two to three times a week and will post info as soon as we hear anything. 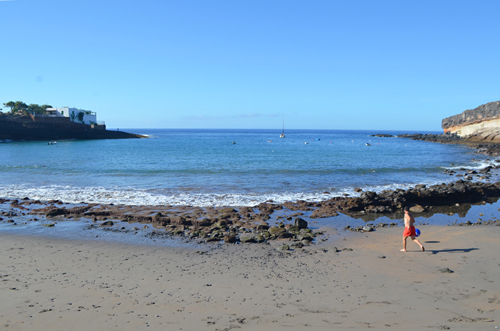 Latest update from this morning (11 March 2019) – Masca Barranco now not expected to open before summer 2019 as work to improve the jetty at the beach hasn’t even started yet. Additionally, when it does, visitors will have to pay to walk the ravine and access to Masca could be restricted to public transport only for visitors.